Essential for drummers and percussionists. 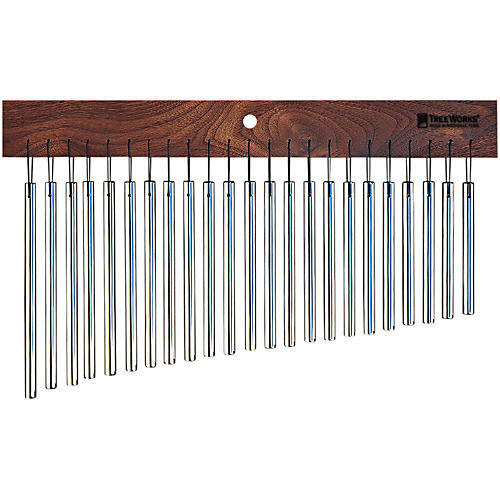 The compact TreeWorks 23-bar single row chime boasts sturdy construction with hand-tied, braided CordLoc and polished, tempered 3/8" thick solid aluminum/titanium alloy bars for brilliant sound. Mantles are made of hand-finished Tennessee black walnut. TreeWorks Chimes is a small company in Nashville, Tennessee, and is the only company that specializes in handcrafting chimes for drummers and percussionists. TreeWorks chimes stand apart from others for their durable construction and clear, distinctive sound. A favorite for ambient soundscapes. Order now.